July 04, 2011: National Highways (NH) are some of the major tourism connectivity highlights of India and being controlled by one organization, National Highway Authority of India (NHAI), it would be wonderful if they published good maps showing all post offices and sub-post offices their road covers with highlights of markets, even the weekday ones (haat). All NHs in India are stories individually to a traveller (Yatri) and following them could make a resource globally. Please try and send your inputs on a National Highway to initiate this resource bank for travellers. I have always found the NH-52 quite interesting, mainly the divisional headquarters, Rangiya in Assam, on the North bank of River Brahmaputra, near the Assam’s capital city of Guwahati. As per the records NH-52 covers 314 kms in Assam and its extension NH-52A covers 22 kms in Arunachal Pradesh and 09 kms in Assam. I remember as a child that Rangiya was quite a happening place as this was a major train terminal, from where you could go a little ahead and ferry across the Mighty Brahmaputra to Pandu Railway station on the Guwahati side or take an extension to Tezpur. Now I have heard that a metre gauge railway extension goes almost upto Passighat in Arunachal Pradesh. The building of the roads and bridges in Northeast India in the past few years have provided convenience to the common people and traveller and we still see that work is continuing. 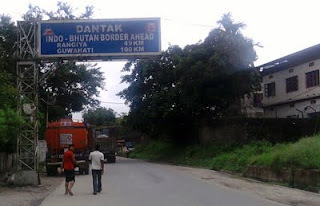 Other than the NH-52, there is an extension road from Rangiya connecting Samdrup Dzongkhar (also spelt as Samdrup Jonkhar) in Bhutan. Other than Phuentsholing, which is the largest official pass between India and Bhutan, this is the second one. 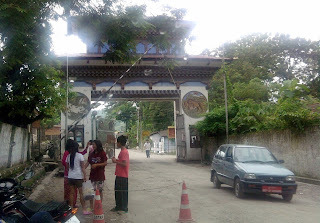 As a traveller, authentic experience and understanding of Bhutan will only happen if someone starts from Phuentsholing and ends in Samdrup Dzonkhar, criss-crossing through Paro, Thimphu, WangdiPhodrang, Bumthang, Tashigrang. There are other passes like Samchi, Sarpang, Gelephu, Gnanglang etc which also needs to be opened immediately for tourism purpose only to confirm peace and prosperity of the people on both sides of the border. This gate of Bhutan is about 50 kms from Rangiya and 100 kms from Guwahati, and though the road conditions are getting much better (a small part of about 20kms still needs to be completed), it takes close to 04 hours from Guwahati because of the bad traffic. After Rangiya, as far as I remember the next big place is Tamalpur, then Kumarikata and finally to the last Indian destination Darrang Mela, which even a few years back was known as Mela Bazaar, Darrang, with dense elephant forests, extending into the hills of Samdrup Dzongkhar. On my travel on NH-52, one change that I have observed in the agriculture pattern this time that there was quite a dominance of Jute (now almost mature), which was only common to lower Assam and North Bengal. The monsoons being a bit late the rice transplant and ploughing for paddy is carrying on full swing now. The rickshaws have pulled their long hoods for protection from rains. I crossed an elephant stopping vehicles on the highway asking for alms, this reminded me of the recently completed meeting of the ‘Shivsagar Elephant Owners’ Association’, the first of its kind that I have come across. This will be a good platform to discuss the proper rehabilitation or function of the domestic elephants, which is more than 1200 in Northeast alone. 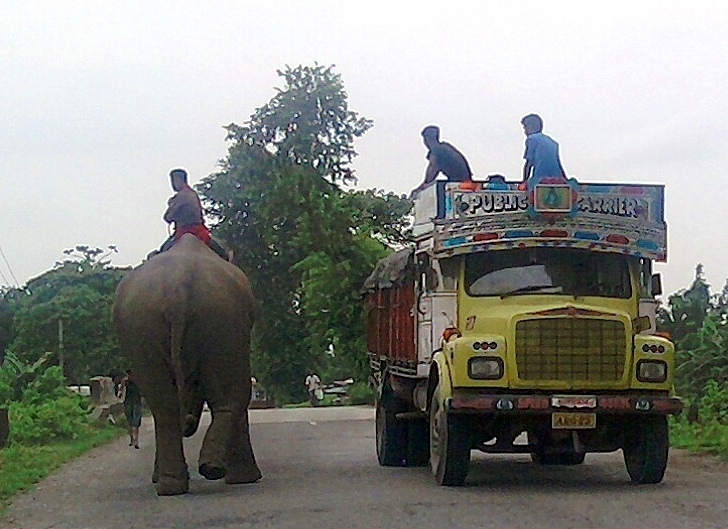 This will also be an opportunity to re-establish the man-elephant culture of India’s Northeast for tourism. 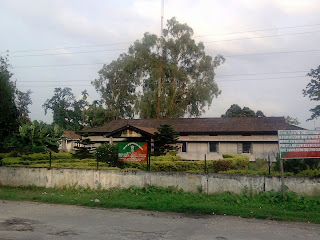 The NH-52, which is often referred to as the North Bank Road alignment is interesting for tourists for its connectivity to sites like Orang National Park, Nameri Tiger Reserve and Pakke Tiger Reserve in the wildlife interest and then we have the Heritage town of Tezpur, often referred to as Sonitpur in the Mahabharata, the Madan Kamdev complex, which I suppose needs better display and interpretation. Also the legendary Ghats (local jetties) should be revived with their stories. I shall remain grateful if someone sends their stories and experiences on the Ghats. I am certain that there are more for a road in Northeast, I shall try and bring them to you one by one. 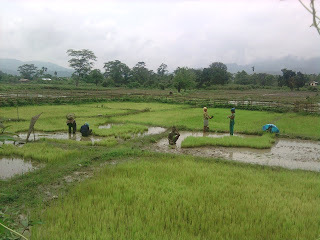 Nice view of Rangiya and adjuscent places. As a people from Rangi, I thank to give this information in this internet. thanx.